- Enhance the efficiency of your communication actions, making them faster than the paper editing, and modifiable at any time. The digital signage allows professionals with the help of Mini-PC Linutop to communicate more quickly. The system can operate 24/7 and is specially designed to be a low consumption system. The configuration is very simple and these fanless microcomputers work silently. Linutop mini-computers are ideal tools for displaying photos, streaming videos, and more. As a digital display medium, they have several features. It is possible, for example, to set the duration of each item to be displayed. Linutop Mini PCs have other advantages. As they are fanless, they consume very little energy and is extremely quiet. Indeed, microcomputers Linutop have an energy requirement 10 times lower than ordinary PCs. The Linutop dynamic display solution is an ideal choice for professionals who intend to broadcast every day. They can be transformed into Internet kiosks with a few clicks thanks to the Linutop Kiosk software included in LinutopOS. Ideal for pharmacies wanting to leave these internet terminals available to visitors 24/7! 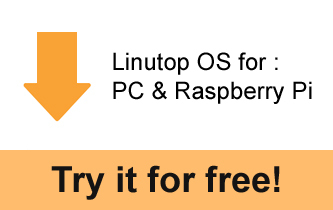 In addition, the Linutop OS is available for PCs and Raspberry Pi. It is available for free download here!